Kronaby is a hybrid smartwatch collection that promises to marry traditional watch design with some familiar connected features as well as a few new ones we've not seen crop up on a hybrid before. The core of the team at the Swedish startup cut their teeth at Sony Mobile. They helped design and develop accessories for the Japanese tech giant including the Sony SmartWatch and Smartband fitness tracker. So they know a thing or two about building wearables. With Fossil, Movado and other large watch brands making more of a push with hybrid smartwatches, Kronaby is playing with the big boys in the tech and watch world. We've been living with one of the watches from the Kronaby collection to find out if this is a hybrid to keep a look out for. Here's our comprehensive verdict on the Kronaby hybrid smartwatch. A watch needs to look the part but with that extra tech on board it's clearly a challenge to make a hybrid that's easy on the eye from all angles. Thankfully Kronaby clearly knows how to make a stylish watch. The entire collection is made up of four different lines and 24 variants, with models for both men and women. We had the pleasure of wearing one of the Sekel models and didn't really want to take it off. This $625 hybrid is a real looker and you'd be hard pressed to know there were components like vibration motion and accelerometer motion sensors lying beneath that steely exterior. It's undeniably a watch designed for men as well, with its 43mm casing and 22mm 3-link stainless steel metal band. There's domed sapphire crystal protecting the watch face and the water resistant design means you can even dunk it underwater up to 100 metres deep. Although we can't imagine many people will want to go swimming with it. Lounging by a swimming pool? That's a more likely scenario. Along with a watch crown that you can press to switch between activity tracking and time modes, there are physical buttons above and below it (more on those shortly). You won't find a heart rate sensor around the back or any other fitness focused sensors helping to maintain that relatively slender frame. So enough about how it looks, what can the Kronaby do? A lot actually, more than your average hybrid smartwatch in fact. To get things up and running first though you need to install the Kronaby smartphone app (iOS or Android). Once you've calibrated the watch from the app, following the instructions to line up the hands on the primary and secondary dials and going through a pretty straightforward setup process, you can start getting to grips with what the Kronaby watch is capable of. Ignoring the very basic settings menu, there are four main sections you need to familiarise yourself with. The first is the watch face, and this where you can add your 'complications'. This essentially lets you assign two smart features to the watch crown and the secondary dial. You've got your pick of the date, activity progress, secondary time zone and a timer. Next up are filtered notifications, where you can assign up to four phone contacts to one of three vibration intensities. The idea is that you can assign your favourite contact to the strongest vibration option. If you swipe down on the bottom segment of the screen you'll also see additional options to get nudged about calendar appointments, turn on the inactivity alerts or add third party app support. Unfortunately, this is perhaps one of the weakest of the smartwatch features as the strongest vibration is still very easy to miss. One of our favourite smartwatch features is the pushers, which lets you assign a series of smartphone features to the buttons above and below the crown. It's only one per button but you have the choice, adding music control, a find your phone mode, using a button as a camera trigger and the ability to remember a spot. There's also a safety-centric Walk me home mode where you can invite a friend to be your safety contact. When you press the button, it will send the friend a location on a map. Like a lot of hybrid smartwatches, Kronaby throws some fitness-related features into the mix, but before you go thinking this is a Withings Steel HR rival, it definitely takes a more basic approach to burning some calories. It's all about step tracking here. There's no sleep monitoring or additional sensors like heart rate or automatic exercise tracking. This is bare bones fitness tracking, so if that stuff is a big deal to you, you're better off looking elsewhere. If you're content with just keeping an eye on your daily steps, then it does a decent job of it. You can set your step goal from the app and view your progress as a percentage in the dedicated app section or on the secondary dial on the watch. We've been putting it up against the fitness tracking skills on the Garmin Forerunner 935 and the step counts were roughly in the same ball park, with no more than a few hundred steps difference between the two. While it's lacking in the fitness department, it does at least offer Apple Health support, so you can collate and combine the data with any other sporty or health wearables you're using on a regular basis. Battery life on the Kronaby is something you don't need to worry about for some time. It's powered by the pretty standard CR302 coin cell battery that you'll find powering a lot of regular watches. 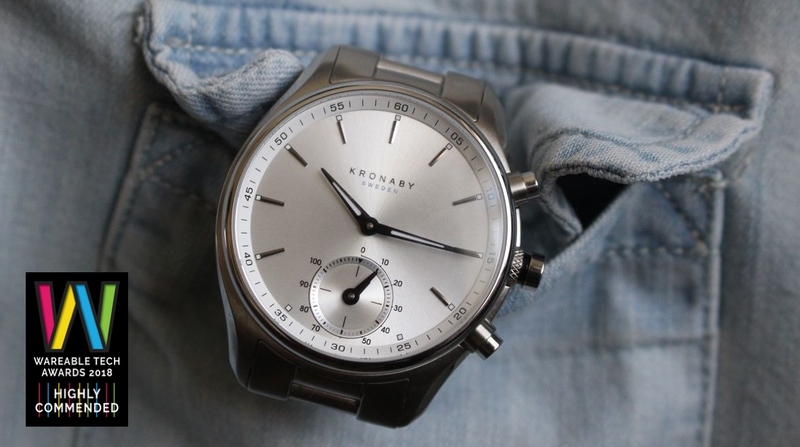 Kronaby states you should get up to two years depending on use, which is actually more than what you can expect to get from a Fossil hybrid like the Skagen Connected. The Kronaby successfully marries beautiful watch design with smartwatch features you’ll actually want to use. Yes, it’s very, very pricey, but in return you get a watch that looks the part and discreetly adds in those smarts. It’s also bringing new ideas to the table and proving that there’s more to hybrids than notifications and fitness tracking. It’s definitely not perfect and there’s room for improvement, but overall this is one hybrid smartwatch we’ve really enjoyed living with and that should be food for thought when Fossil, Movado and the rest approach their next hybrids.